Last weekend, I had the pleasure to be on a panel on the topic of Transformative Learning in Business. This conversation with Sabine Amend, Elizabeth Dolan, Louise Hansell, and David Hodgson, our panel facilitator, was recorded on Saturday, April 14th, 2012. It was part of a summit Re-Imagining Learning: A Virtual Summit on Transformative Learning hosted by Meridian University. Perhaps it is time we get to know the ‘beast’ and learn about its chameleon-like personality. Depending on the context where it has been analyzed, it bears different names and has been depicted slightly differently. But as you are about to learn, it seems to follow pretty much the same pattern—it is in fact, an archetype. Indeed, the process of change is nothing else than the evolutionary pattern of life and creativity—a pattern that pervades the entire Universe. I begin the inquiry with the well-known story of the birth of the butterfly. Next, I use complexity and chaos theories to shine some light onto the evolutionary pattern of change. Finally, I borrow from other fields of inquiry such as chemistry, ecology, organization theory, story telling, mythology and the creative process to show the similarities in the way the process of change has been described from these different perspectives. “Inside a cocoon, deep in the caterpillar’s body, tiny things biologists call ‘imaginal disks’ begin to form. Not recognizing the newcomers, the caterpillar’s immune system snuffs them. But they keep coming faster and faster, then begin to link up with each other. Eventually the caterpillar’s immune system fails from the stress and the disks become imaginal cells that build the butterfly from the meltdown of the caterpillar’s body. The butterfly story has become a metaphor for social change, as our old systems are slowly collapsing to hopefully give rise to a vision of human society in which people live in harmony with others and with nature. Fig. 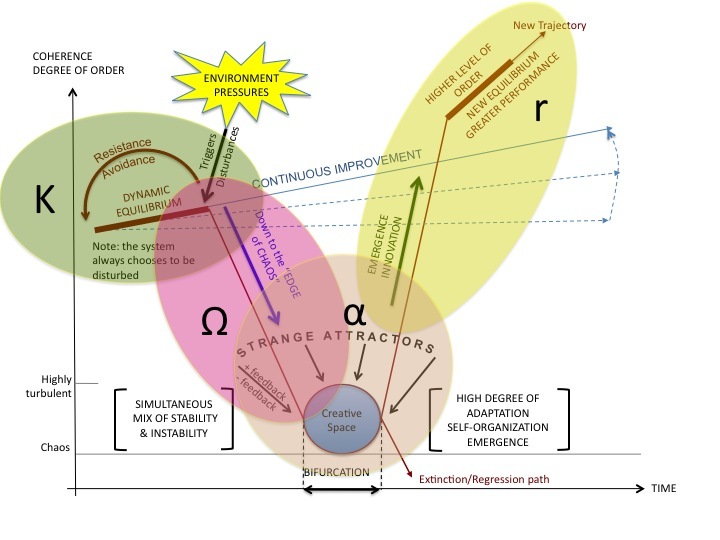 2 – CAS and LS Adaptation at the Edge of Chaos © 2012 Beatrice Benne, Ph.D.
Obviously, a system may go through multiple phases of change throughout its life—alternating between periods of stability and instability, continuity and discontinuity, order and chaos. The pattern described in the previous section, when viewed from an evolutionary perspective, looks like Figure 3. The system progressively moves away from equilibrium until it takes a deep dive toward the “Chaos point” where the bifurcation resides: from there, the system may take a breakthrough path or a breakdown path (Laszlo, 2010). And the process repeats throughout the life cycle of the system. Ilya Prigogine (1917-2003) won the 1977 Nobel Prize in chemistry for his work on dissipative structures, which demonstrates that order can arise from disorder. Prigogine showed that, left on its own, a mixture of specific substances in a dish results in a chemical reaction that creates concentric patterns spiraling for several hours at the surface of the dish (Fig. 4). The ordered patterns represent a decrease in entropy (i.e., increase in order) within the dish—entropy that is dissipated to the environment. Here again, when energy and matter flow between an open system and its environment, order and patterns emerge when the system is far from thermodynamic equilibrium, i.e., at the edge of chaos. The Conservation Phase K at the state of dynamic equilibrium. The Release Phase Ω, as the system’s structure starts to breakdown faced with disturbances (internal and external). The Reorganization Phase a, a chaotic phase of learning, creativity and self-organization. The Exploitation Phase r, when the system reaps the benefits of its transformation and grows, before its growth starts to slow down and the system enters a new K Phase. Fig. 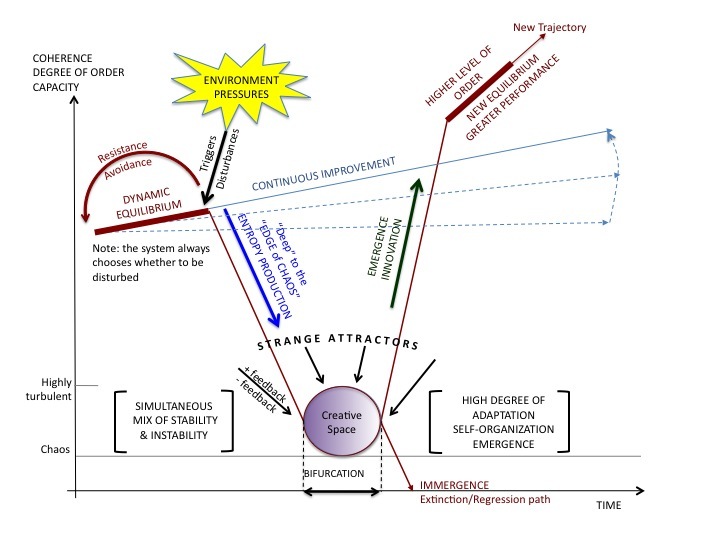 6 – Adaptive Cycles Over CAS Adaptive Process © 2012 Beatrice Benne, Ph.D.
Otto Scharmer’s seminal work on Theory U provides another perspective of the process of change, albeit applied to social systems. Theory U depicts a method or process to help individuals and groups move through different stages of cognition, while deepening the level of learning and insights from one stage to another. The different stages of cognition are: downloading; seeing; sensing; presencing; crystallizing; prototyping; performing and embodying (Scharmer, 2007). 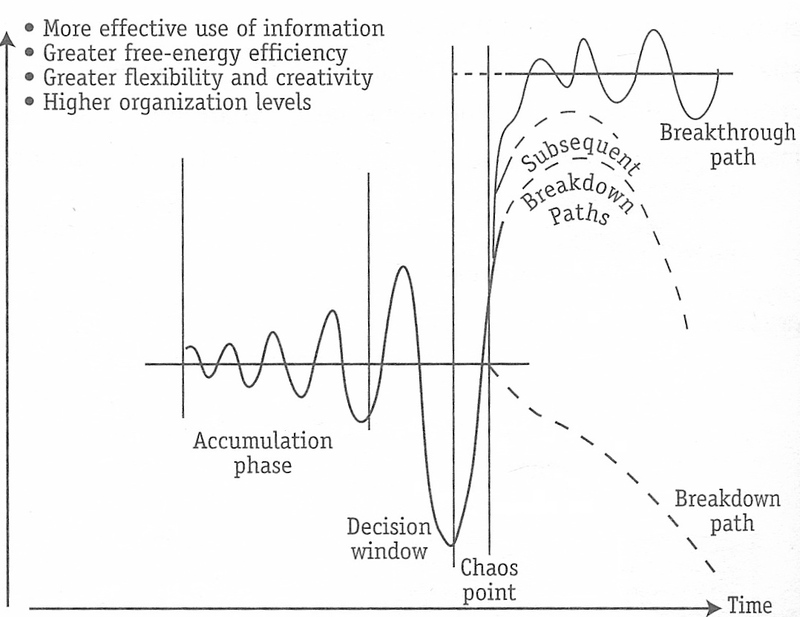 One should not fail to notice the similarity and overlap between the adaptive process of complex adaptive systems at the edge of chaos (Fig. 2) and the U Movement (Fig. 7). A social system in a stage of downloading operates at a dynamic equilibrium, maintaining its performance through the application of routines and best practices. Faced with the need to change, the system may start challenging its old assumptions and worldviews. As it does so, it begins to see reality with fresh eyes and uncovers deeper patterns that perhaps kept the system stuck. Slowly, the system is becoming aware of the fact that its own structure is, in fact, responsible for creating the behaviors that need to change. Entering next the stage of ‘not-knowing’ the system becomes more open to authentic learning, and potentially able to connecting to a deeper source of knowledge and insights. This stage is often uncomfortable, as the system must remain there long enough, at the edge of chaos, for self-organization and emergence to occur. This is a highly creative state, should one be patient enough to accept the confusion in which one might find oneself. In a state of Presencing, when insights arise, knowing what decisions to make and strategy to implement seem very straightforward: the path ahead is now obvious: the system starts prototyping and testing the new ideas and strategies and eventually, implementing them at a large scale. Eventually, the system achieves a higher state of knowing and level of consciousness—a new dynamic equilibrium. I find it quite interesting that the basic three act story structure used in plays or movies follows a similar pattern (Fig. 8a and Fig. 8b). In the Beginning act, the characters in their normal life situation are introduced (i.e., at their dynamic equilibrium). Slowly, the story develops, describing the situation and “conflict” the characters face, i.e., the disruption in their lives. In the Middle act, the story develops through a series of complications and obstacles (some resolved, others unresolved) finally leading to the ultimate tension and crisis—the Climax. In the final act, the End, the climax and the issues are rapidly resolved and the tension dissipates. This story structure has been used through the ages all over the world in myths and tales to reflect the pattern of our personal and collective struggles: it represents the pattern of life and transformation and was captured eloquently by Joseph Campbell’s Hero’s Journey, which I’ll describe next. 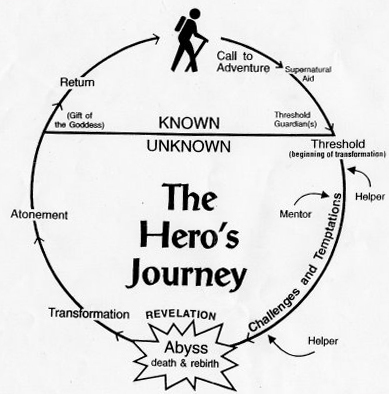 The Hero’s Journey has three main phases, each including multiple steps. In the first phase—Departure—the hero is presented with a call for adventure, the initial indication that something is going to change. Often, the hero refuses the call because of all the familiar reasons of inertia, fear, sense of inadequacy and so on. When the hero finally commits, s/he may often receive the help of a supernatural protective figure. This is the point when the hero must cross the threshold, i.e., go through an ordeal to move from the every day world to the world of adventure. The hero enters the “belly of the whale” which represents the final separation between the old world/self and the potential for a new world/self. The second phase—Initiation—is marked by a series of adventures that test the hero’s ability to move to the next stage of his/her development. Even though supernatural helpers will often support the hero through his journey, s/he might fail some of the tests. The meeting with the goddess is a critical phase when the hero experiences unconditional love and begins to see her/himself in a non-dualistic way. The hero will eventually have to face the monster, wizard, or warrior in the final battle (climax of the journey). This is the ultimate test when the transformation takes place: the ‘monster’ i.e., the ‘old self’ in the hero must be ‘killed’ so that the new self comes into being. The final phase—Return—is not as easy as it might seem. It is often as dangerous to be returning from the journey, as it was to embark in it. The hero may need the help of guides, especially if the transformative experience has weakened him or her. So the hero must again cross the threshold of adventure and do so while preserving the wisdom gained on the quest. S/he must find ways to integrate all the learning into human life and share it with other—not a trivial thing to do. The hero must be master of two worlds, i.e., able to achieve a balance between the material and spiritual worlds. As a result the hero gains a new level of mastery: the freedom from the fear of death, which is the freedom to live. In the Hero’s Journey, we once again witness the same pattern of becoming. As personal life crisis or challenges pushes us to leave the comfort of our everyday routine (stable state), one is faced with the choice of accepting or refusing the call of adventure. Accepting the call forces us to move to the edge and face our own demons. The more we are able to let go of the old ways of thinking and patterns of behavior—a process often felt as an internal “death”—the more we can learn and transform ourselves until we emerge from the abyss, through the process of rebirth, as a new Being, able to operate at a higher level of complexity and wholeness. The challenge is then to integrate the learning into our lives and ways of being so that we can act from a different place—a place of increased wisdom and love. The transformative change process is a highly creative process very similar to the process that artists go through when they authentically create. As art psychologist Anton Ehrenzweig (1967) explains, the creative process is related to the primary process when the unconscious scans the chaotic oceanic state of undifferentiated order (i.e., a state where everything is connected and whole). In contrast to the conscious state, which per nature fragments and differentiates, the unconscious is able to access the great complexity of undifferentiated structures that are at the origin of dreams and unconscious phantasy. 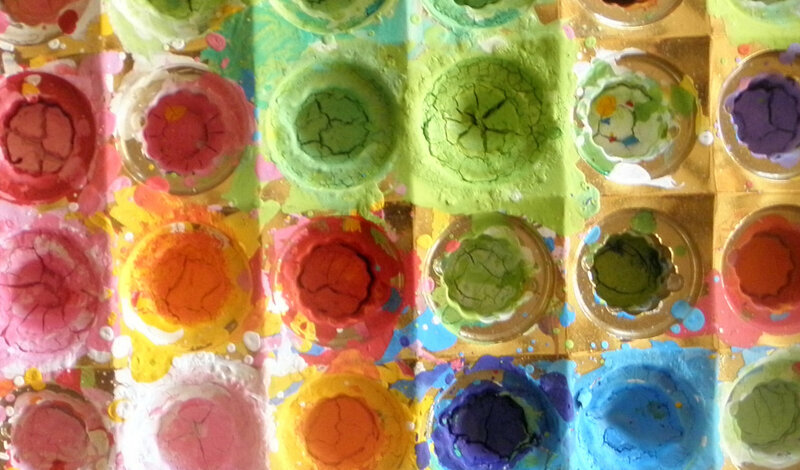 For the artist, the challenge is to tap into undifferentiated order without letting the ego take control over the process by creating defensive and rigid responses when stressed with the anxiety that inevitably is associated with the chaotic phase. When the ego is able to yield a shift of control, the unconscious becomes a source of insights, which the conscious mind can use, in the secondary process, through a process of dedifferentiation as the mind returns to a conscious state of awareness to exploit the insight and create something new. 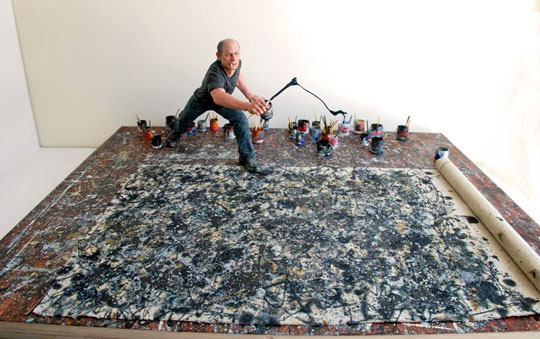 The work of the artist Jackson Pollock is, for that matter, particularly interesting. Indeed, it has been demonstrated that what one might dismiss as “random” drips of painting, are actually an in-depth, intuitive study of “certain features of fluid dynamics” where the artist uses physics as its partner in this seemingly co-creative process — and he performed this before any physicists thought of studying fluid dynamics (see article: The Cutting_Edge Physics of Jackson Pollock, Wired Magazine, July 5, 2011). 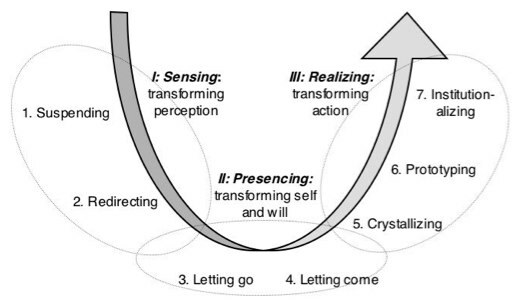 The primary process, which I believe is identical to a state of Presencing (Senge, Scharmer, Jaworski, Flowers, 2004), is an embodied experience of pre-cognition and of sensing the whole; it requires breaking up the pattern of thought while awakening the creative unconscious mind. This process is source of direct and intuitive knowledge that often emerges in a flash of understanding. Any individual, whether in the arts, science, or in other creative domains (including management) must have the capacity to navigate this process in order to be creative. Through the review of diverse models, I aimed to demonstrate that whether in the domain of nature, social systems, or individual creativity, the process of transformative change follows the same evolutionary pattern. The process is very much fractals in that it operates in a similar fashion at the level of an individual, group, organization, but also at the level of society, nature/ecology and at the level of the whole universe. I believe that by gaining some familiarity with the pattern and its related phases one might be able to identify where we are in the process at any given time, make sense of the confusion when it arises and be better equipped to ride the wave of change. In addition, it is critical to learn which specific tools are best appropriate to facilitate each one of the phases so that to meet their requirements and achieve their respective purposes. Finally, one must develop the capacity to maintain ourselves, at the edge of chaos, using our unconscious as a means to access deeper insights. Accomplishing all the above requires commitment and practice. It also begins with engaging our heart in the process so that to not let us paralyzed by fear. Easier said than done! Ehrenzweig, Anto (1964). The Hidden Order of Art: A Study in the Psychology of Artistic Imagination. University of California Press. Jaworski, J., Kahane, A., Scharmer, C. O. PresenceWorkbook. Society of Organizational Leaning. Laszlo, Ervin (2010). The Chaos Point: The World at the Crossroads. Piatkus. Scharmer, Otto C. (2007). Theory U: Leading from the Future as It Emerges. Society of Organizational Leaning, Cambridge, Massachusetts. Senge, P., Scharmer, O. C., Jaworksi, J., Flowers, B. S., (2004). Presence: Human Purpose and the Field of the Future. Society of Organizational Leaning, Cambridge, Massachusetts. Walker, B. and Salt, D. (2006). Resilience Thinking: Sustaining Ecosystems and People in a Changing World. Island Press. I very much look forward to participating to the Sustainable Brands ’12 Conference in San Diego June 4-7. If you are going, make sure to connect with me. I would love to discuss with you about what you can do to perceive your business reality with new eyes; reframe your challenges; better navigate your complex and uncertain environments; re-invent yourself; and create your own future. It’s all about creative thinking toward innovative solutions. Hamlet. Do you see yonder cloud that’s almost the shape of a camel? Polonius. By the mass, and t’is like a camel indeed. Hamlet. Methinks it is like a weasel. Polonius. It is backed like a weasel. Hamlet. Or like a whale? What do you think your personal and professional problems look like? In which category would you put the challenges faced by our society today? Consider a clock: it is a mechanical system that is relatively static in configuration. If it stops working, you may take it to a clock repair shop where an ‘expert’ will open it, take it apart, analyze the problem and develop a diagnostic of what’s wrong with it. With a system such as a clock, there exist only a finite number of problems that can occur—that is, the problem set is well defined and clearly understood. Often, the problem can even be anticipated. Now, consider a cloud: in contrast to a clock, a cloud is a dynamic system with no defined boundary. Ask different people to describe the shape of a cloud and they will likely come up with different interpretations: one may see a bear; another a duck; yet another a rabbit. The shape of a cloud is, in fact, the emergent result of the interactions of water droplets and other chemicals suspended in the atmosphere; it is always changing and sensitive to any small changes in its environment. The behavior of a cloud is unpredictable. Problems of a clock type, even the highly complicated ones, are technical. The nature of a technical problem is usually well defined: ‘experts’ from multiple disciplines may collaborate with one another to analyze the problem by decomposing it into sub-problems until the issue under consideration is fully understood. Once the origin of the problem is known experts can find a solution to fix it. In contrast, issues that resemble clouds are ill-defined or ill-structured. In a 1973 paper, social policy planners Horst Rittel and Melvin Webber dubbed problems of a cloud type ‘wicked’ (see: 10 characteristics of wicked problems by Rittel and Melvin). In the domain of complex social and organizational problems, systems thinker Russell Ackoff used the terms ‘social messes’ and ‘unstructured reality.’ I personally prefer to use the term ‘adaptive challenges’ that was coined by Harvard professor Ronald Heifetz (1994) in his seminal book Leadership Without Easy Answers. Strategic business challenges such as the need for dealing with uncertainties and dynamic business environments; designing and launching new products or services; developing a corporate social responsibility strategy; negotiating with employees and trade unions; identifying the culture and identity (brand) of a firm; etc. 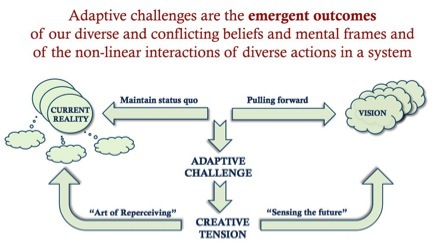 Adaptive challenges arise from the complex interactions between different sets of values, beliefs and assumptions and the divergent understandings of the situation. Adaptive challenges are symptoms of deeper structural dynamics and root causes that are often hidden from our level of awareness because of their complexity. Unfortunately, our society has the tendency to attempt to resolve its problems by solely resorting to technical expertise while avoiding the difficult adaptive work required to effectively confront issues that call for a fundamental change in our values and beliefs. Adaptive challenges call for different approaches than the ones used for solving technical problems. Adaptive work requires people to undertake a deep transformational journey by which they let go of their traditional values and mental models and embrace a completely new world view—one in which short-term and long-term goals are not in conflict with one another, nor are self-interest and group-interest. However, most people are neither motivated nor have developed the skills to deal with adaptive challenges. Most of us get overwhelmed by the sheer complexity of our challenges. The situations we must deal with are politically charged and involve a large number of stakeholders belonging to different organizations and systems; the issues are full of ambiguity; and the path forward is unclear. Within this context, we are tempted to reduce complexity by fragmenting—leaving some elements out of the process and/or considering them independently of one another. This, unfortunately, only takes us away from the source of insights and breakthroughs that specifically resides in the understanding of the interactions between the tangible and intangible elements of a system and in an awareness of the patterns that emerge out of these interactions. 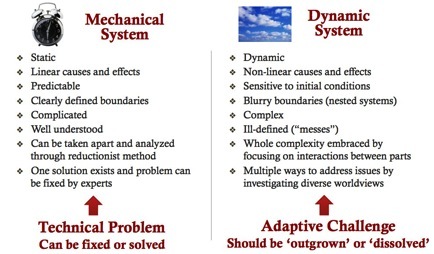 Embracing the whole complexity of a system is necessary to uncover the root causes of adaptive challenges. To embrace complexity in a productive way, a structured process is required that provides a collaborative platform and a safe container for a constructive dialogue to take place. The process is designed to encourage the sharing of divergent views; make distinctions explicit; create new meaning; play with “what if” scenarios; and facilitate the emergence of insights. In addition, the process supports the management of unproductive anxiety and has the added value that it fosters the development of empathy and trust among participants over the long-term. 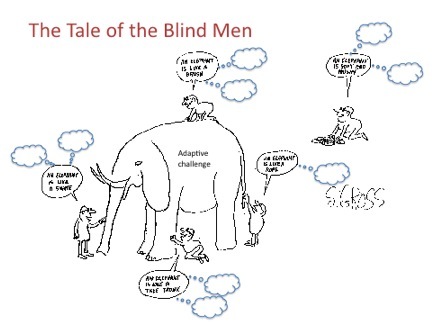 Faced with an adaptive challenge, we are like blind men trying to describe an elephant: based on our different background and expertise, some of us sees the elephant as a tree while other people identify it as a snake or as a rope. Who is right? No one and all of us to some extent! Our blind spots corner us into supporting positions that are ungrounded. Left unchallenged, our divergent ways of perceiving reality generate misunderstandings and conflicts. The good news is that it is possible to learn how to perceive reality with new eyes and it’s urgent we develop this critical skill. Using diverse approaches that make the best use of both sides of the brain (i.e., analytical thinking as well as pattern recognition/creativity) participants are invited to engage collaboratively and help one another inquire into the nature of the “big elephant”— using generative conversations and dialogues as well as creative techniques and activities that help people move back and forth between sensing (primal knowing) and analytical thinking. In breaking out the existing pattern of thought we leave the space for “flashes of understanding” to arise, which can then be interpreted and tested to generate new agreed meaning. As we let go of the old beliefs and assumptions and open ourselves to learning we create a field for emergent possibilities, within which deep insights arise. Our inner eyes start to perceive previously hidden patterns, which tell a richer and more accurate story of the nature of reality. Our understanding of the adaptive challenge shifts, as we now perceive the deeper structural dynamics that have been at the origins of our challenge. As we uncover the root causes of the issue, what we initially believed was the problem now dissolves: we have outgrown the problem. From a clear understanding of the dynamics of the system (i.e., what happened in the past), we can better explain the behavior of the system (i.e., the challenge in the present), while simultaneously getting a sense of future emergent possibilities. This is a very creative phase, when one can engage in designing solutions and strategies that will support our vision and desired outcomes. As we commonly say, “necessity is the mother of invention.” When dealing with adaptive challenges, necessity might also be the mother of change and transformation. Yet, we should not believe that reason could be the only driver of change. Embarking on a transformative journey without engaging the heart will hinder, if not bring to a halt, the process. Personal and group transformation requires deep listening and empathy toward others and a willingness to open our mind to the messages sent by our deeper selves. Moreover, as we begin the journey, the unavoidable feelings of fear and anxiety, which are deeply rooted in our bodies, arise. Left unacknowledged fear and anxiety can lead to paralysis. In contrast, when we bravely face our fears and explore their origins with curiosity, we are able to overcome what Robert Kegan and Lisa laskow Lahey (2009) calls our “immunity to change,” thereby unlocking our potential for authentic transformation. A transformative process is not for weak hearted! The Irish playwright and socialist George Bernard Shaw said: “The reasonable man adapts himself to the world; the unreasonable one persists in trying to adapt the world to himself. Therefore, all progress depends on the unreasonable man.” Is it unreasonable to believe that we can change? I believe it is! And so, unreasonable we must be. A successful journey of change always begins with a belief, a determined will, and a choice. One must BELIEVE that change is possible, which is to say, one must believe we are the source of our challenges and, therefore, the only people capable of addressing them. One must have the WILL to investigate the challenge and go deeper into its root causes and, thus, accept responsibility for our past actions and/or inactions. Finally, one must CHOOSE to commit to the process—a process, which is often difficult and emotionally draining but that can also be extremely rewarding. How could not it be? Transformation is the process of life! My overall purpose when facilitating adaptive challenge is to develop the adaptive and creative capacity of the individuals and groups involved to empower them to facilitate new emerging challenges independently in the future. This is an urgent necessity if one wants to overcome the societal crises we now face. Heifetz, Ronald, 1994. Leadership Without Easy Answers. Harvard College. Kegan, Robert and Lahey, Laskow Lisa, 2009. Immunity to Change: How to Overcome it and Unlock the Potential in Yourself and Your Organization. Harvard Business Press. 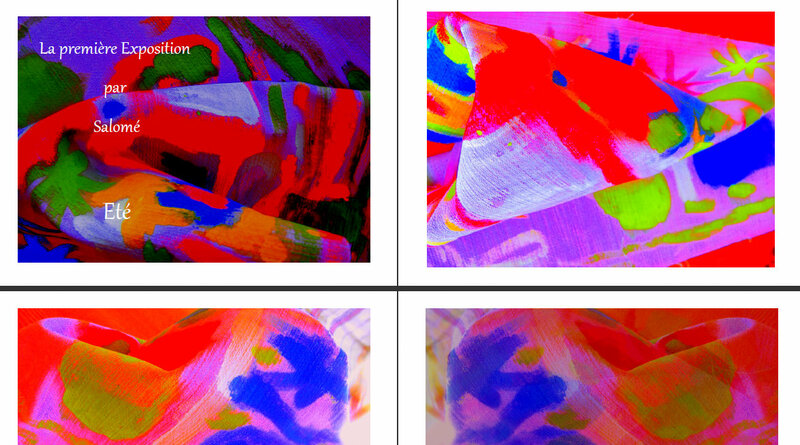 Last week, my mom exhibited 25+ of her energy-charged and colorful abstract paintings on fabric, including two pieces (on fabric as well) from Andrew James Campbell. The exhibition was outside, in the garden of our country house in the Lot in Quercy, France. 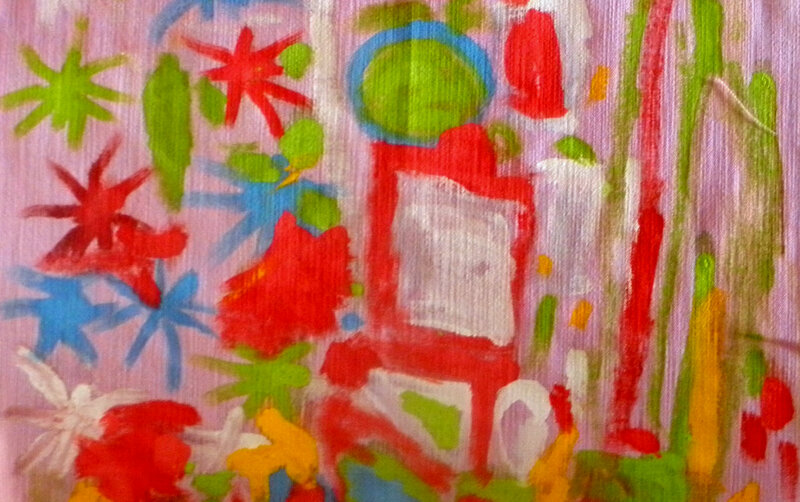 The paintings were hanging in trees, in bushes and on the façade of our old house. We also had very large panels on free-standing frames. The whole things looked quite unique and whimsical, art mixing up with nature in a playful and unpretentious way. Zoé and Salomé, aged 10 and 4 years old respectively, and their parents were on vacation in the area and seeing out posters came to visit us. We had advertised ‘creative sessions’ and a free hand-painted tee shirt for participants bold enough to practice painting on my mom’s fabric. 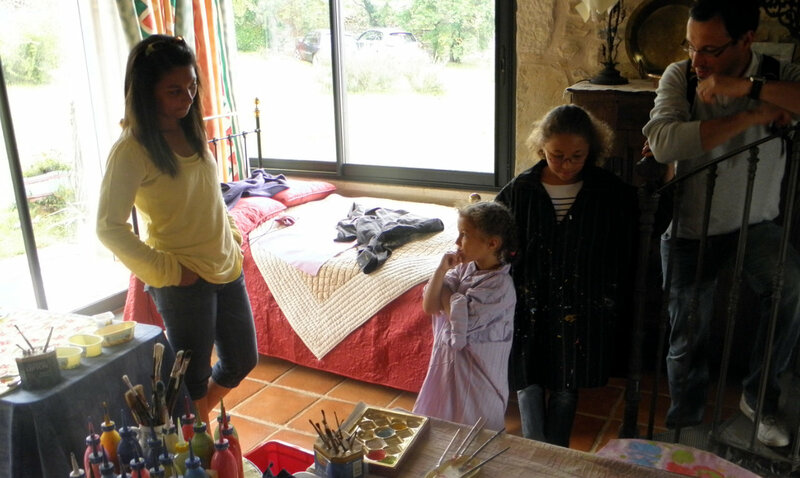 So after looking at the exhibit, Zoé’s and Salomé’s parents asked the girls if they wanted to paint. Looking at one another with a shy smile, they could not resist such an opportunity. My mom set each of them up with a small camping table, each with a square fabric cut to the dimension of a cushion, the color was almond green for Zoé and grey pink for Salomé. She put some paint of different colors in empty chocolate boxes (the perfect palette) and gave them brushes for each color. And while we stayed around chatting with their parents, the girls went to work. There is much that we have learned from simply watching the creative process of two lovely sisters. Zoé, the oldest, methodically started painting red and white flowers, carefully laid out in a gorgeous pattern that seemed designed for the next spring fashion collection in Paris. She was totally focused and full of care, yet one could feel she was still slightly aware of what was going on around her. Her design or pattern had something of the same quality referred to by Ehrenzweig in his book “The Hidden Order of Art:” a pattern that can be reproduced in such a way that the whole is creative and not only the individual parts. In Zoé’s painting, it is the whole that is harmonious while irregularities generate ‘liveness’ and vibrations within. At first, we could see an ever so slight sign of embarrassment in the girls’ parents. It is so natural: all parents want to be proud of their children and show them at their best. Even in our convivial and relaxed atmosphere, it was clear that Zoé and Salomé’s parents were wondering what their girls would be capable of creating. So, their early reaction was a slight dismissal of the girls’ work in progress—perhaps their way to lower any expectations; they are only children after all. But over time, while my mom and I started to seriously pay attention to the artwork the girls were making and admiring their focus, as well as their creativity, the parents’ attitude shifted from this dismissal to curiosity. The girls’ mom even asked something like: “Do you really think it’s any good?” and to me after I mentioned how fascinated I was by Salomé’s creative process: “Why are you so interested? Do you do this kind of work professionally?” To which I provided a short overview of the creative retreats Andrew and I co-facilitate and of our interest in the process of creativity in general and the fact that our approach with adults is to help them reconnect in part with the creativity spirit of their childhood. 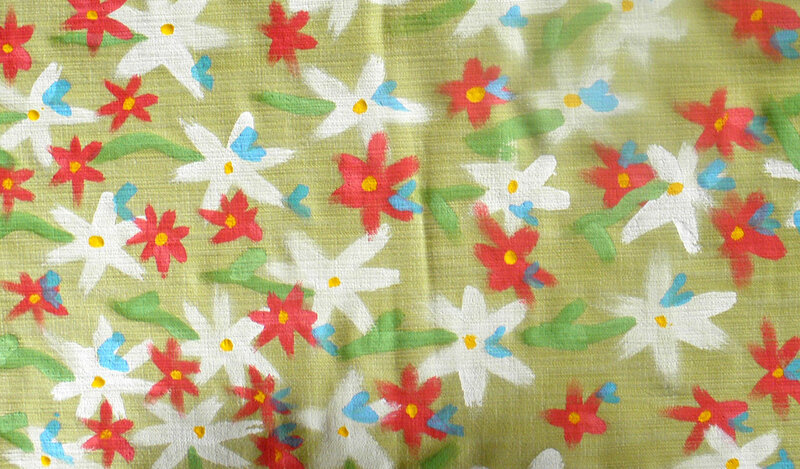 We suggested them to leave their paintings over night so that they could dry and we could fix the paint on the fabric. In the evening and throughout the next day, Andrew spent quite a few hours creating three gorgeous documents presenting the girls’ art pieces at their best. 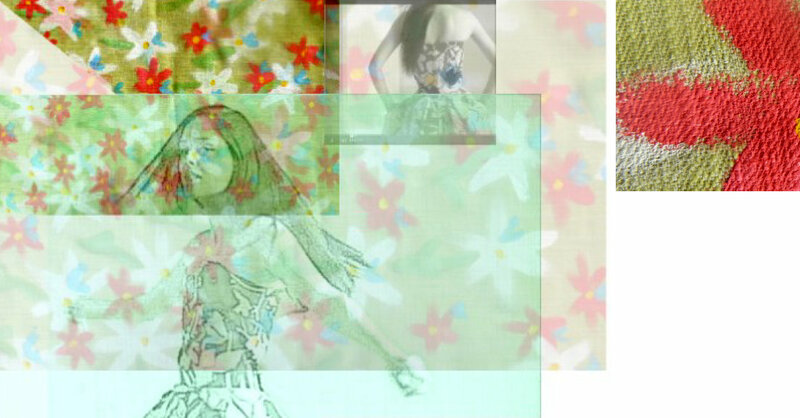 It is he who saw in Zoé’s flowers next spring fashion pattern and created a stylish picture of a young woman wearing a fluid dress. For Salomé, he deconstructed her work a bit, took snapshots, enhanced the colors and imagined Salomé at her first art exhibit. Everything looked gorgeous and highly inspiring so it is not surprising the family was in awe the next day when we presented the documents to them and very touched by so much care and considerations. Andrew writes, “Someone I don’t know the name of once said that the master-pupil relationship should not be trapped inside a curriculum, a program, a teaching, an ideology, a plan, a goal. The master is not trying to transfer certain knowledge or skills to the pupil. She has no educational goals for him or her; she is not interested in transforming him or her into something. She loves him or her. She has a caring love for him or her. No strings attached. She nourishes hopes about her pupil, but she has no expectations.” We had no fixed expectations for Zoé and Salomé; we did not teach them anything; we did not even think that the experience could be transformational in any way. And yet, I believe there was much learning that took place for all of us present—adults and children. We all attended each other with care, attention and love. We let things emerge and as they did, we responded accordingly. While leaving our home, Zoé and Salomé’s mom told my mother: “you made me feel better!” I cannot help to wonder what will Zoé and Salomé remember from this experience. Will they dream of future careers as artists? Will this experience change their approach to creativity and life in general? Will they have enough strength and courage to continue on their own path, not letting themselves influenced by conventions and norms? For me personally, it is Salomé’s spontaneity and her ability to not censure her creative process—censuring being a trap I am so easily falling into in my own work—that I will remember and will practice. It is also the fact that much learning can take place in a leisurely way, when one does not expect it or don’t work for it but when one is free to receive openly. All photographs and photo montages by Andrew James Campbell. Never have learning capabilities been so important considering the complexity of today’s reality and the level of uncertainties one has to deal with on a daily basis. Whether a university student, an entrepreneur or a manager in a corporation—or any other human being, in fact—we all need to develop authentic learning capability in order to cope with the events in our lives and in our work environment and the need for change. As Arie De Geus (1997) long discovered, decision-making is a learning activity but, as he pointed out, conventional learning methods are not effective because they are slow; they close options; they depend on learning by experience (trial and error), instead of by simulation; and they breed fear. While I pretty much agree with these reasons, I believe there is a deeper issue with the conventional process of learning—that is, it doesn’t take full enough account of the creative, transforming, generative power of learning and the idea that much learning consists of ‘primary learning’ and occurs below the level of consciousness. No other living systems’ capacity is more important than the capacity to learn. Life depends on it. Our learning disability causes incoherence in our thought process: we are unable to see clearly, thus even less able to take actions that could improve our conditions. On an individual level, learning disability in people often translates into an inability to live a purposeful and meaningful life, while creating much anxiety, depression and unhappiness. At an organizational level as well, I would argue that the main reason for the failure and collapse of firms and social systems is due to their inability to learn. Too little focus is brought to the development of this deep learning capacity—hence the drama unfolding in front of our eyes that is jeopardizing our own survival and evolution. My intent, here, is to highlight only a few of the multi-faceted characteristics of the process of learning which leaders must embrace in order to navigate the present and co-create a better future. There is nothing wrong with using the prevalent analytical approach to developing knowledge as long as one understands the limits of the reductionist method (analysis paralysis) both in terms of its scope and its applications. Integrative, holistic approaches to learning have the benefit of uncovering patterns in what seems contradictory and divergent. Integral learning takes place in an open system able to continuously and more fully sense the environment in order to capture emergent opportunities. It takes a complementary approach that embraces both/and thinking versus dialectical dualistic either/or thinking. Synthesis is an act of active connective creation, which finds wholeness in what had been previously fragmented. Learning takes place in the domain of action (i.e., in the doing) and through the experience the action creates. The act of perceiving is inherent to the learning process. Maturana and Varela (1987) assert, “[T]he phenomenon of knowing cannot be taken as though there were “facts” or objects out there that we grasp and store in our head. The experience of anything out there is validated in a special way by the human structure, which makes possible the “thing” that arises in the description…every act of knowing brings forth a world…All doing is knowing, and all knowing is doing.” Experiential learning can have a powerful impact on the reflective learner, who is awake and aware of what is happening inside and outside of him/herself, throughout the process of experiencing. As such, learning is active; it requires full participation of the individual in a live conversation (with oneself and with others), i.e., in a dynamic thinking process and set of interactions that are open, spontaneous, respectful, and inclusive of divergent perspectives. Some learning is liminal or primary: it occurs below the level of consciousness and leaves reason aside, at least for a little while. This type of learning, which is very familiar to artists, taps into an undifferentiated level of order, i.e., a non-fragmented and seemingly chaotic world of Oneness—a world that collapses the boundaries between what is inside and what is outside. In the “Hidden Order of Art,” Anton Ehrenzweig states that “unconscious scanning makes use of undifferentiated modes of vision that to normal awareness would seem chaotic. Hence comes the impression that the primary process merely produces chaotic phantasy material that has to be ordered and shaped by the ego’s secondary process. On the contrary, the primary process is a precision instrument for creative scanning that is far superior to discursive reason and logic.” Ehrenzweig believes that creativity is highly related to the chaos of the primary process and that “[T]he creative thinker is capable of alternating between differentiated and undifferentiated modes of thinking, harnessing them together to give him service for solving definite tasks.” The learning dance and movement between differentiated and undifferentiated modes of thinking creates “flashes of understanding,” which emerge spontaneously. This direct and intuitive learning process requires a high level of awareness and openness (i.e., presence) in order to sense the Whole. It also requires the acceptance of high level of ambiguity. The resulting “primary knowing” is the source of breakthrough thinking and creativity. The spontaneous emergent learning described above is a ‘deep learning’ process which most often happens at the “edge of chaos,” a transitory phase created by entropy production (i.e., the generation of heat and chaos in a system that pushes the system away from dynamic equilibrium toward a paradoxical phase of simultaneous stability and unstability). As the system settles for a while at the edge of chaos, under specific conditions, the components of the system are able to adapt and self-organize and potentially create new structures and a newly realized and higher level of order—an emergent process. The result of this creative process is evolutionary in nature and increases the wholeness and complexity of the system (evolution, here, is a word to be understood as ‘increasing complexity’). For us, as humans, this process entails the letting go of old mental models and patterns of behavior; the ability to see with new eyes; and the capacity to live for a while in a deeper than normal transformative process, resulting in the development of new beliefs and worldviews. This process is irreversible (i.e., non mechanical), reflecting life itself; it provides a new and firm ground from which to develop new strategies and actions and achieve ever-higher levels of performance. So what is authentic learning? Authentic learning is a birthing process—a process of “becoming being.”** As such it often necessitates a midwife to facilitate its emergence. While we are all learners, we can also take the role of the midwife when the situation requires it, assuming we fully understand what it takes to give birth to a new “Self.” Unfortunately, what would seem to be so natural to human development has taken a strange turn throughout our evolution. Somehow, we have lost touch with the most fundamental and basic requirements of the process: openness, authenticity, respect for the diversity of ideas and opinions, trust, letting go, accepting ambiguity and the fact there are no right answers, and so on. Authentic learning then is an act of deep creativity. Deep creativity is an act of authentic learning. Taken together, both capacities have the potential to elevate us to the next stage of our consciousness and evolution. Whether we are willing to learn to ‘become’ is yet to be seen. Yet, for the sake of all humanity it might be worth a try. * Adriaan Michiel de Lange (1945-) is a South African chemist physicist and transdisciplinary scientist, who studies how thermodynamics, the base of modern complexity studies, applies to the humanities—more specifically, he suggests that entropy production must apply to the metaphysical world as well as to the process of physically knowing and learning. In the late 1990s, de Lange began sharing his theories at the learning-org.com forum. ** The expression “becoming being” is borrowed from AM de Lange. De Geus, Arie (1997, 2002). The Living Company: Habits for Survival in a Turbulent Business Environment. Harvard Business School Press. Ehrenzweig, Anton (1967). The Hidden Order of Art: A Study in the Psychology of Artistic Imagination. University Of California Press. Berkeley and Los Angeles. Maturana H. R. and Varela F. J. (1987). The Tree of Knowledge: The Biological Roots of Human Understanding. Revised Edition. Shambhala. Boston and London. 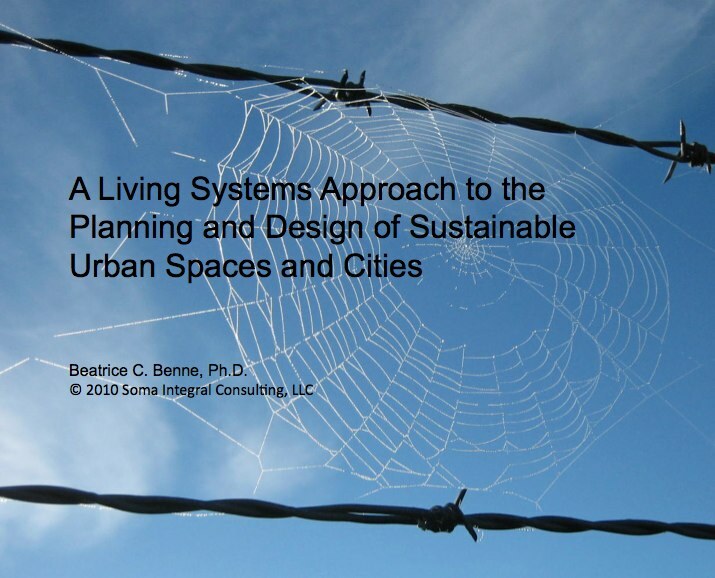 A few months ago, I had the opportunity to present A Living Systems Approach to the Planning and Design of Sustainable Urban Spaces and Cities to local urban planners; my talk was received with enthusiasm and I am pleased to share it to a broader audience. What gives an urban space its character, personality, quality, identity, and its sense of coherence and order? What are the characteristics of a sustainable, adaptive, innovative, resilient, and regenerative city? What do living systems teach us about the attributes of a healthy and regenerative city and what are the implications for city planning and design? While the reductionist scientific method we inherited from Descartes and Newton has proven to be very effective for the development of technological innovations, this approach is very limited when dealing with the complex adaptive challenges faced by our cities today and even more so, by the cities of tomorrow: population density or lack of; social justice issues; poverty; economic issues; environmental problems such as pollution (water and air), watershed health, greenhouse gases emission, waste management; energy issues; food accessibility; and so on. Systems thinking teaches us that complex systems have emergent properties that do not reside in any of their parts. In order to understand the whole, we must embrace complexity and focus on the dynamic interactions between the parts (feedback loops). Complex systems are dynamic and unpredictable; they cannot be controlled or managed. Most often, addressing a problem in isolation may cause another problem over time. Fortunately, the understanding of the systemic structures of our urban environments may allow us to find high leverage points where to intervene to positively influence the future of our cities. 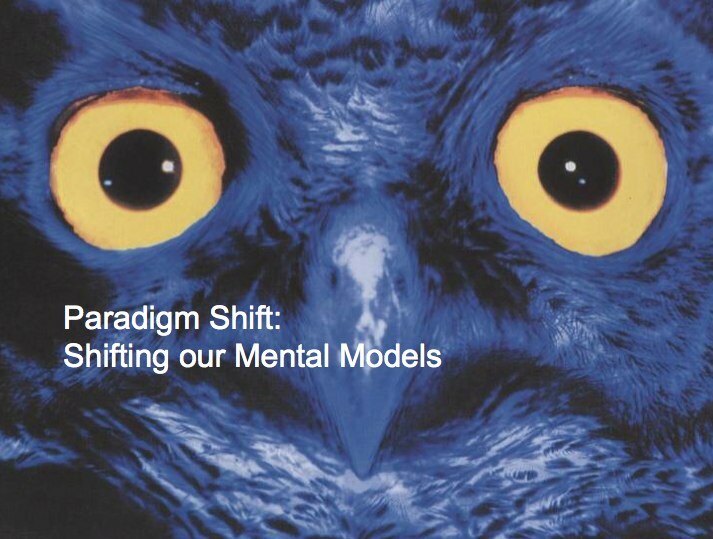 The highest leverage points, however, are to be found in our worldviews and mental models. This section considers the key attributes of living systems: openness; purpose; autopoiesis (self-creating); structure-determined behavior; diversity and differentiation; adaptation; self-organization; and emergence, and discusses these attributes within the context of a city. A city that is ‘open’ facilitates the development of connections, interactions and relationships. Efficient, interconnected physical infrastructures facilitate exchange of goods and mobility of people internally within the city and externally with its region and beyond. The presence of open/public spaces as well as the elimination of any “walls,” physical or metaphorical, support interpersonal and intercultural interactions. Communication network facilitates exchange of knowledge, talent, qualified labor and investments. From an evolutionary perspective, a city that is ‘open’ continuously and dynamically changes and evolves over time. It encourages community engagement, stewardship and leadership in envisioning the city’s future (a city developed by the people for the people). An autopoietic city is a city that uses its network of communication to maintain life and its sense of identity, i.e. the culture of the place. The physical, social, cultural, political, economic structures of a city reciprocally influence one another in a way that is mutually reinforcing. A city has the power to choose to redesign its (infra)structures and institutions so that to generate new patterns of behavior, thereby enhancing the quality of life and of the surrounding natural system. Diversity is necessary for creativity and survival. A healthy city encourages diversity at all levels: culture and ethnicities; physical and knowledge assets; characters and styles; built and open spaces; public and private spaces; and so on. A healthy city is one that has developed its adaptive capacity and resilience in order to flexibly learn, self-organize and adapt to contingencies. The transformation of a city over time should increase its level of coherence and wholeness and strong sense of identity. A healthy, regenerative city cannot be designed or built. These qualities are emergent. 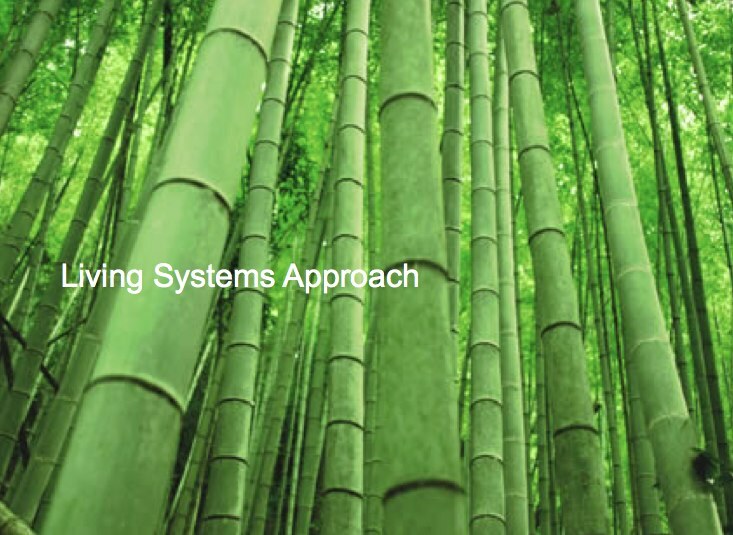 From a living systems’ perspective, sustainability is a capacity, not merely a set of goals, metrics or criteria, nor a ‘thing’ that can be built. A living systems approach to urban planning embraces complexity (as opposed to reducing it by focusing on individual parts independently) and focuses on building the adaptive (learning) capacity of the place: it is about sustaining life — an evolving process of continual renewal. The understanding of the local context is primary to increase the resilience of a city. One cannot acquire tacit knowledge of a place solely through analysis. The emergent qualities of a place can only be understood by experiencing the place. 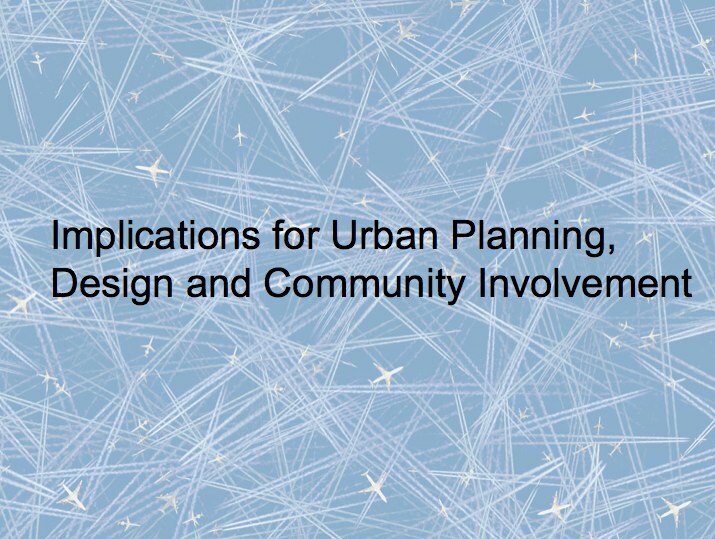 Consequently, city planning and design should support processes that increase participants’ learning and discovery and help people reconnect to the place where they live. There are no easy and simple solutions to the design or sustainable and regenerative cities. Urban planning is an adaptive, transformative process that requires us to challenge our beliefs, values and mental models. The process must transfer ownership and leadership to the community and leverage the collective intelligence that resides locally so that creative solutions emerge out of the collaboration between stakeholders.